The Tower Inn has 63 rooms all featuring our standard room amenities, premium bedding, DVD/VCR, flat screen TVs and more. See our full list of room amenities. 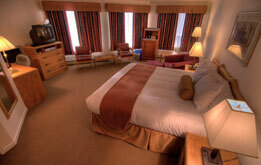 Are you planning a romantic escape to the city of Quesnel and are seeking intimate and cozy accommodations? Quesnel's Tower Inn features a VIP Suite including a DVD player, Jacuzzi tub, two bedrooms, queen size beds, loveseats, standard room amenities and more. Our Executive King Room is perfect if you require more space, are traveling on business or if you want to entertain. 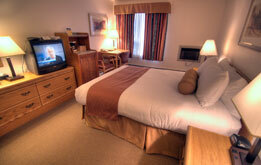 Complete with our standard room amenities, king size bed, DVD player, large writing desk and lounging chair. 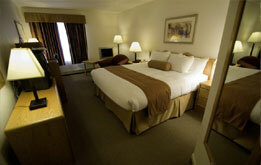 This room is ideal for couples traveling to Quesnel, business executives, and solo travelers. Our King Size Room features our standard room amenities, lounging chair, large work desk, high speed internet access and more. Traveling with a group? This room is perfect for those who have more than two people in their group. Complete with two queen size beds, flat screen TV, high speed internet access and our standard room amenities, this room is also a fabulous choice for family travel. This room is perfect for those that need some space as they sleep. Featuring a queen size bed, lounging chair, handicap access, our standard room amenities and more, it is suitable for anyone traveling on business or pleasure. 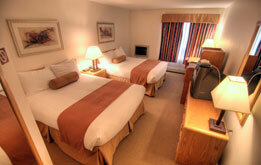 We also offer three handicap accessible single queen rooms available.